Wonderful green bean soup is a delightful way to enjoy a little taste of summer on a cold winter’s day. This delicious low calorie recipe is a great addition to any diet plan. Whether you have fresh, frozen or canned green beans this is a quick meal to make. So why is this particular vegetable getting such a positive buzz lately? Well, we know they are low in calories but they also offer these additional benefits. Since they are a rich source of fiber this meal is an excellent choice to prevent constipation, help lower cholesterol, promote heart health and prevent blood sugar levels from rising too rapidly after a meal. This makes beans not only a good choice for dieters but also for people battling with diabetes, cholesterol issues or hypoglycemia. They also provide us with antioxidants, folic, acid, vitamin B6 and magnesium. On medium high heat place oil, butter, bay leaf and all vegetables into a large soup pot and sauté ingredients for 5 minutes, then add flour and sauté for another 3 minutes while mixing well. Add all liquid and salt and pepper to taste. Bring ingredients to a boil, reduce heat to low and simmer for about 15 minutes or until vegetables are tender. Stir in chopped dill and parsley. Garnish with a dollop of sour cream if desired. If you don’t have any chicken broth on hand just substitute the broth with water and add two chicken bouillon cubes. You can substitute frozen beans or canned beans for fresh, just adjust cooking time for beans if needed. If you enjoy gardening and haven’t tried growing green beans yet perhaps you can make a little extra room and plant some as they are easy to grow. Once fully matured you can benefit from the harvest eating them fresh and then blanching the rest and freezing them in the appropriate serving sizes you need for your family. What a great way to enjoy them all year long. 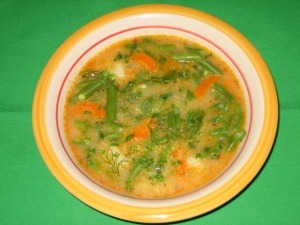 This green bean soup is certainly a tasty way to get your daily source of fiber.